Nestled in the Microsoft booth you’d see two televisions back to back, with four players sitting on each side of the screen, playing an odd pixelated game filled with bugs, berries, and a giant snail? 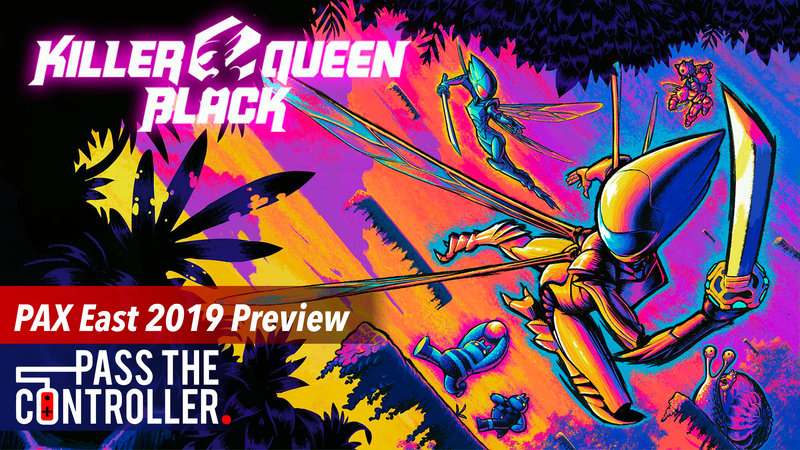 Meet Killer Queen Black, a game that is ready to satisfy your competitive hunger in a cooperative, strategy platformer for up to eight players. Forcing you and three friends to work together to defeat your opponents while trying not to ruin your friendships in the meantime. The goal of each match of Killer Queen Black is simple, you want to win three rounds of play before your enemies do and in order to do that, you have three different routes to victory. All three routes are accessible at anytime in any round, it all depends on how you and your team decide to strategize and react to what the other team is trying to accomplish. In each round the first team to either ride the giant snail to their flag post, fill your team’s base up with berries, or kill the other team’s queen three times will be declared the victors. Though, even with three different possibilities to achieve glory, coming out on top isn’t as easy as you’d think. Coordination and the right person controlling the queen are vital to securing that dub. In each game, one person on your team controls the queen while the others control grunts who have the ability to grab berries, ride the snail, or use berries at fixed stations on the map to evolve into a bigger bug with a weapon or shield depending on what you choose. In this one hit kill scenario for all players, a balance of having some armored teammates to help protect the queen is necessary while the others move the snail or deposit the berries. This type of objective based gameplay is something that I live for, it’s why I prefer games like Overwatch where the goal isn’t merely to get more kills but it’s using strategy and skill combined with teamwork to reach a group goal. Killer Queen Black gave me similar vibes to games like Towerfall that have this frenetic energy about them, you’re in control but there’re so many moving parts to one round of Killer Queen Black that managing where you need to be and when is just as enjoyable as the platforming and attacking are. We visited the Killer Queen Black station a few different times over the course of the weekend because we really couldn’t get enough of the competitive bloodlust that dwells within us, that and facing off against the developers at Liquid Bit never got old. The gameplay and art style of Killer Queen Black are clearly derived and inspired from games of the past, but the strategy and polish of what Liquid Bit is doing with this competitive eight player romp is something that I think will be embraced by the casual and competitive crowd alike. Stylistically, great pixel art is always something that attracts my attention. I know part of it is most likely nostalgia, but I truly feel as though good pixel art is a timeless aesthetic and when done well looks phenomenal and not like some cheap riff on an old NES game to pull at your heartstrings of the days of yore. Killer Queen Black is a game that has been on my radar ever since it was announced to be coming to Switch during a previous Nintendo Direct. The gameplay met my expectations and solidified Killer Queen Black not only as a recipient of one of our Best In Show awards this year at PAX East, but also confirmed its spot as one of my most anticipated games of this year. I can totally see an eSports scene grow around this community if the online matchmaking is reliable and smooth. For all things Killer Queen Black and indie game related keep it locked to Pass The Controller– and for a deeper dive on all things gaming and nerd culture related listen to the Pass The Controller Podcast with new episodes weekly. To continue the conversation with us, join our Discord community too! This was one of my favorite games Brenden! Can’t wait to smoke people on switch. Snail dubs all damn day! Thanks for bringing me along to check it out that Saturday!